The new RoboWrap Matrix is an up-todate addition to the Saimatec RoboWrap range of fully automatic wraplines. This layout concept takes the renowned Optima Wrapping Concept one step forward, implementing overlap wrapping with the intelligent moving wrap dispenser. Significant development has been put on improving the versatility of the wrapline. Flexible use of different wrapper materials in the same system. 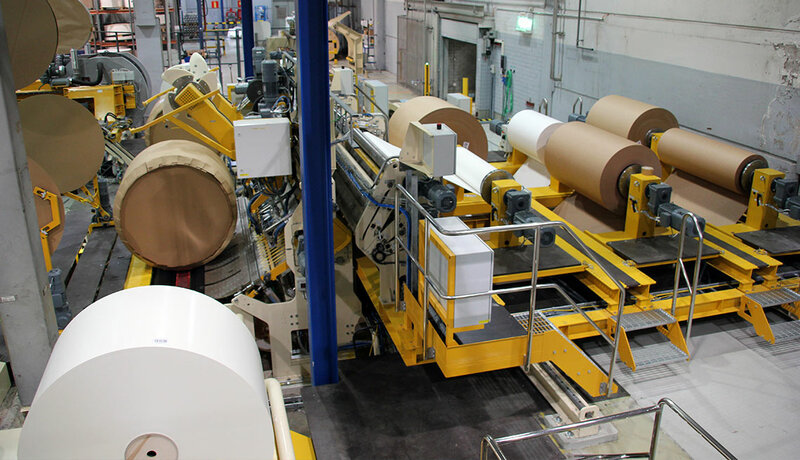 Besides new projects, this technology is equally good for modernising existing systems for Optima Overlap Wrapping. Patent is pending for this new feature. Every mill is looking for extended uptime of its production equipment. In order to reach this, Saimatec has further developed the inner and outer head storage system. The new two story head storage table houses maximum 15 head sizes up to 1900 mm in diameter on a single, compact storage unit. When completed with secondary storage, up to 21 head sizes are arranged in a compact layout. Also this feature may be combined with other wrapline models, and as an upgrade or modernisation, too. Patent is pending also for this new feature. Saimatec’s renowned Optima Wrapping with Smooth Wrapping Technology is thecore of all RoboWrap systems. This provides the high output, high quality and high operational uptime of the machine, resulting in best possible overall performance. As other models, Robowrap Matrix will be complemented with our complete range of roll handling products including conveyors, turntables, kickers and receivers, vertucak conveyors, upenders, and muchmore.